The Coach House (circa 1896) was the first of six outbuildings built on the grounds of the Drumthwacket estate owned by Moses Taylor Pine. 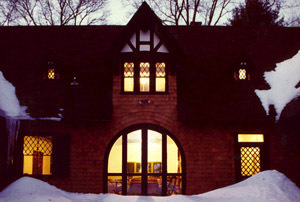 Designed by Raleigh C. Gildersleeve, the Coach House is in the Shingle Style. Divided off from the original estate and made into a private residence in the early 1940's, the present owners have stripped away numerous layers of improvements and recaptured the architectural integrity of the original building. Archways once covered up were exposed, dropped ceilings removed, exterior walls restored, and a new staircase created to fit the scale of the house. The interiors feature Victorian rosewood furniture that came from the owner's ancestral home in Goa, the Portuguese province of India. The pendant lighting fixtures known as handis are blown glass oil lamps originally imported to India from Belgium.